Jumbo was an African elephant born in East Africa in 1860. He was captured in early 1862 and became the first African elephant to arrive in modern Europe alive. Jumbo spent time in Italy, Germany and Paris, France before being traded to the London Zoological Gardens in 1865. During his sixteen year stay at the London Zoo, Jumbo was introduced to his handler Matthew "Scotty" Scott, who became a lifelong friend. The citizens of London quickly became enamored with the elephant that enchanted visitors by taking them for rides on his back through the zoo. In 1882 P. T. Barnum purchased Jumbo from the London Zoo for $10,000 with the intent of making him a circus star, an easy feat for the biggest elephant in captivity that stood at just over thirteen feet tall. Despite the objections of the British public, Jumbo was shipped to the United States where he would join the Barnum, Bailey & Hutchinson Circus. Scotty accompanied Jumbo and became his handler in the circus. Jumbo toured with the circus for three years during which he continued to delight children with rides on his back while earning millions of dollars for the circus. Unfortunately, Jumbo’s life was cut short when he was struck by a train on September 15, 1885 in St. Thomas, Ontario, Canada. The circus had just concluded its performance, and the elephants were being led to their boxcars when an unexpected train came upon them. A dwarf elephant by the name of Tom Thumb was hit by the train and broke a leg. Jumbo was struck from behind and received serious injuries. The majestic elephant was dead minutes after the accident. Barnum, ever the showman, spun his own version of the event where Jumbo selflessly threw himself in front of the train to protect Tom Thumb and Scotty. During and after his life Jumbo was an international sensation. Jumbo was featured on everything from hats to leather boot advertisements. After joining the circus, Jumbo was frequently pictured along with Tom Thumb. 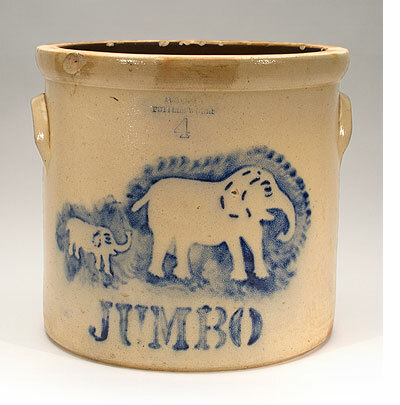 The two elephants are pictured on this stoneware crock from the Somerset Potters Works in Somerset, Massachusetts which may have been advertising Jumbo or may have been memorializing him. This crock was offered in our Premier Auction 128, September 21-30, 2015.